Last week I was invited with my wife and several other Seattle-area writers to visit the Ruby Princess, a ship operated by Princess Cruises since 2008 with over 1,500 passenger cabins and 1,200 crew. 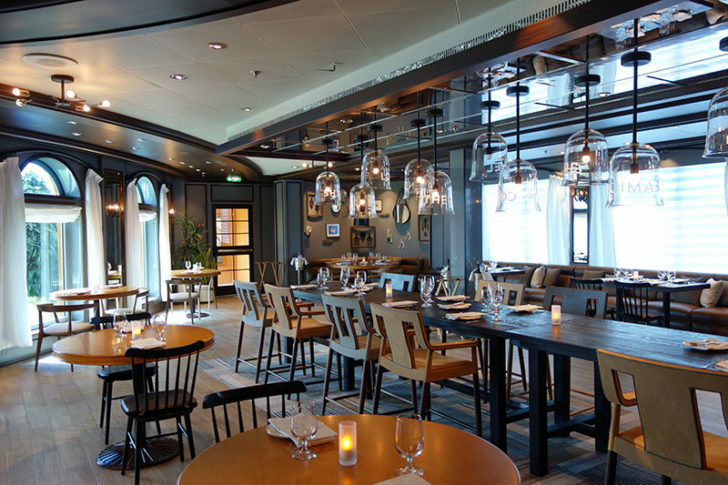 We had about five hours to tour the ship and eat in three specialty restaurants: SHARE by Curtis Stone, The Salty Dog Gastropub, and a Chocolate Journeys experience held in the Crown Grill steakhouse with a menu designed by Norman Love. As someone who has never taken a cruise before, I was interested at the very least to go on board and take a look around. I’m the kind of person who likes to know what I’m getting into, and unlike an all-inclusive resort or even Las Vegas (two of the closest comparisons) there aren’t a lot of options to get off the ship except for scheduled shore excursions. So my post will cover everything I saw — not just the food. First, let me say that like Las Vegas, it would probably help if you paid extra for a premium room or have some kind of frequent cruising status. We saw dedicated lines for passengers in suites, and a separate sitting area with coffee and pastries. Though we were among the first people on board, the lines were not especially long at the beginning of the day. But you can still expect a few thousand people to arrive over the course of a few hours. Look at it like this: the sooner you board, the sooner you can begin enjoying your vacation. We had to go through a cursory security check (imagine a level similar to TSA PreCheck), fill out a short health questionnaire, and then pause for an ID check and photograph before boarding the ship. For those worried about motion sickness, I never felt the ship moving. Maybe that changes at sea, but I can’t imagine it would be very bad for a vessel with that much inertia. Our first destination was SHARE by Curtis Stone. It’s the newest celebrity restaurant and also located on the Emerald Princess. Upon entering, I didn’t feel like we were on a ship at all. This could be any modern restaurant. Service began with wine for everyone. Perfect. This restaurant has an exclusive wine list that isn’t served anywhere else on the ship and includes two Schramsberg sparkling wines (brut rose and blanc de blanc) and a Ridge Lytton Springs Zinfandel (no vintage listed, but likely the 2013). They must have known I was coming. 😀 Those are literally my two favorite wineries. Then the head chef came out to describe the menu. But we were already digging in. I started with a Sonoma Coast Chardonnay, the signature chicken liver mouse, a charcuterie platter, and a small salad, which were all great. In my opinion, this restaurant could hold its own against the rest of the Seattle restaurant scene if located on land. The twice cooked duck was the only disappointment. It reminded me a lot of duck confit (maybe that was the goal) but didn’t come close to the same texture. Ultimately I expected one thing and got something else. However, the tagliatelle with Alaskan crab and the roast turbot (not pictured) were great. If you haven’t been on a cruise before, it might surprise you that there are still lots of new costs once you get on board. Yes, your trip is “all inclusive” if you will be satisfied with the main dining room and buffet, but a restaurant like this will cost $39 extra. From this perspective I think $39 is a great deal, and I appreciated that Princess allows guests to visit specialty restaurants as often as they like. We skipped dessert because of the chocolate tasting later that afternoon and went for a quick tour to burn off some calories. Oddly enough our first stop was the buffet, where several people were digging into lunch. We then got to go above deck to the pool area. There are four pools and seven whirlpools, and as you expect they aren’t especially large. This is a ship. Going to Alaska. Pool time would not be one of my priorities. But there’s plenty of space for sunbathing and strolling about for a view. I admit I was concerned about the noise. The large television airing a concert above the main pool made the area more exciting but also not best place for peace and quiet. Fortunately the back of the boat has an area appropriately called “The Sanctuary.” For $10 a day you can hang out here, with a separate pool (a much larger pool at that). I could barely hear the music from mid-deck. That cover charge includes hot chocolate and a few other non-alcoholic beverages, or you can order off a larger menu. I would probably spend most of my trip here. Back inside we got to see more of the ship’s public spaces, including the main theater, the central lobby, and the main bar, Crooners. I was impressed that they were able to fit so much in. Apparently the rigging for the theater spans several decks up and down throughout the ship. It’s either an engineer’s dream or a nightmare. Of course, not everywhere is so spacious. Once you move off the main decks you can feel the ceiling height drop a foot or two. I’m about six feet tall. It wasn’t claustrophobic, but it was definitely noticeable. In the evenings, the Wheelhouse Bar converts to the Salty Dog Gastropub, which has live music and a selection of speciality cocktails. Even the beers are brewed especially for Princess Cruises. I got to try the Seawitch Steam, made with Woodford Reserve, sweet vermouth, IPA syrup, and lemon, as well as a Seawitch IPA brewed by Strike Brewing Company in San Jose. The food menu has a $19 cover charge and includes an appetizer, three small plates, and either truffle or sweet potato fries. We got to try the “Ernesto Burger,” which was pretty good, as well as a few other items. I’m less convinced that this is a great deal for the price, but it is a good option if you want variety. And remember, you can visit the bar without paying more for the speciality food. I think it’s worth mentioning at this point that food isn’t the only thing you pay extra for. Beverage packages cost more, too. A standard cruise includes food at the buffet and a few restaurants plus basic beverages such as drip coffee and tea. If you want soda or juice, that package starts at $8.05 per day. An unlimited beverage package with cocktails, beer, and wine (up to $10 each) costs $56.35 per day. Specialty coffees aren’t included in either package. Instead they work off a punch-card system with 15 drinks for $35.65. Now, some of us would drink six cocktails before lunch, so the unlimited plan is not such a bad idea. I like to drink as much as the next guy when it’s already paid for. But I also bristle at the idea of choosing between six drinks and none. I could probably limit myself to a beer with lunch and two glasses of wine at dinner and come out ahead rather than buying a beverage package. That would also give me some more power to choose the drinks I want rather than settle for what’s advertised at $10 or less. We ended our trip with a visit to the Crown Grill, where a large display of chocolate desserts was set up for us to taste. It was definitely made it worthwhile for my wife to tag along. It was much more than any of us could eat after already having so much food that day, but I got to taste several things without worrying about finishing them. One of the concerns I always had about a cruise is that you’d get stuck with a buffet and cheap buffet food. Now, I’m aware that I was eating in the steakhouse, not the buffet, but Norman Love desserts are served throughout the ship. These were very good, and if that level of quality is shared in other kitchens then I would not be disappointed. If mealtime doesn’t offer enough chocolate, you can also pay extra for a wine and chocolate pairing at the Vines wine bar or a variety of chocolate desserts like these during afternoon tea. I didn’t actually get to visit any of the staterooms during our tour. I’m told those are small — space is at a premium, and the ships’ designers understandably splurge on public spaces rather than individual rooms. But that wasn’t my biggest concern about taking a cruise. My two questions — “Is the food any good?” and “What will I do with my time?” — were well addressed and don’t worry me as much as before. In fact, I now look forward to the food on a cruise. It does seem clear that I’ll have to pay extra. Specialty restaurants, beverage packages, and maybe even passes to The Sanctuary in addition to what I’d spend on shore excursions. But at least I think I’ll get something worthwhile in return for that surcharge. There are also sites like Cruise Critic that do for cruises what FlyerTalk does for airlines and hotels, and Princess Cruises does a better job than most at publishing menus and fees online for you to do your homework before you arrive.